explainxkcd.com is failing me: can anyone explain the Care Bears reference? Who or what is "SMAC"? Surely it's the spaceship people we've taken three months longer than? The airplane people had all of human history to get to the Wright brothers. qvxb wrote: If a. person is in the voting booth with the curtain closed, how can anyone tell they are taking a selfie? Because they post it on Instagram, of course. Wait, all these people died of the Green Death. Who buried them? ...I just noticed that, according to the title text, Ponytail is a type A3 V star. Title text: They're limiting the playtesters to type A3 V stars, so the games will all end before the Sun consumes the Earth. This actually sounded like a cool game until the real-time part. Which is probably the point. 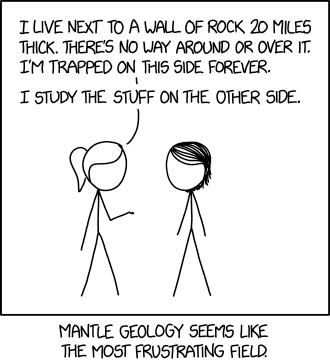 Title text: I don't trust mantle/core geologists because I suspect that, if they ever get a chance to peel away the Earth's crust, they'll do it in a heartbeat. There still isn't a post for today's comic? What is with you people? I am none of those professions, but I regularly have all of these thoughts except the "trees = air" one. And roller coasters. I don't get those either. And coloring books. And parades. And, for the most part, fireworks displays. And just about all sports. I can understand being scared of fireworks displays, and I suppose parades have the danger of possibly including scary clowns, but coloring books? Though the title text isn't true for me, so there's that. C'mere, the lot of you. Stand still. THWACK! THWACK THWACK THWACK THWACK THWACK! KER-THWACK!!! I immediately thought of Cazaril contemplating his pebble, and apparently, so did Cazaril's creator. Cousj001 wrote: Drat, I though my idea of making a fortune by selling smartphones to whales as already been though of. THWACK! THWACK THWACK THWACK THWACK THWACK! Also, +1 internets, but THWACK. chenille wrote: What is the title text talking about? Jaden Smith is only 19. Isn't that one of those movies that Doesn't ExistTM, like any Matrix movie other than the first one? Or am I mixing it up with something? DH = Dear Husband, DD = Dear Daughter, DS = Dear Son. For multiple children of the same gender, you'll sometimes see DD1, DD2, etc. You'll sometimes see these defined as Darling instead of Dear. Regarding the title text: Randall, come here. No, right here. A little closer. There. Now stand still. THWACK! THWACK! THWACK THWACK THWACK THWACK THWACK!!!! Zylon wrote: Oh my, looks like Randall's feeling preachy again. Not even trying for a joke. I dunno, I thought it was pretty amusing. Not the first time he's made this particular observation, but that doesn't make it any less true. I don't get it, and explainxkcd isn't being helpful. This looks like a continuation of Interaction. markfiend wrote: "Closing background apps when you're not using them makes your battery drain faster" Is that true? That's what I came here to ask. Explainxkcd is not being helpful (yet).